Note: A referral may be required in order to see this Specialty Physician; please consult your Primary Care Physician prior to scheduling an appointment. Dr. Saurabh Shah is a board certified Ear Nose and Throat Specialist with a special focus on Allergy and Sinus care. He joined Graybill Medical Group in 2016. 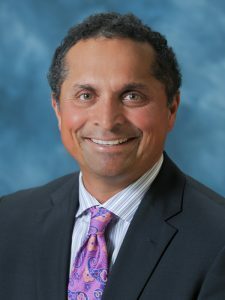 Dr. Shah earned his Bachelor’s degree in Human Biology from Stanford University, graduating with honors and distinction. He attended medical school at UC San Francisco, where he was awarded the prestigious Regents Scholarship based on his academic achievements and personal accomplishments. He was also elected a member of Alpha Omega Alpha, a national honor society for medical students that promotes student leadership, community service, and excellence in academics. He completed his Surgical internship at UC San Francisco in June 1996 and his Otolaryngology – Head and Neck Surgery residency there in 2000. Originally from Utah, Dr. Shah returned to his home state in 2000 and for over 16 years, practiced Otolaryngology with the Granger Medical Clinic (GMC). He served on the GMC Board of Directors for many years, helping to grow it into Salt Lake City’s largest independent, multi-specialty medical group. He served as Chief of the Department of Otolaryngology at Latter Day Saints Hospital in Salt Lake City from 2008 to 2012. Dr. Shah is a Fellow of the American Academy of Otolaryngology – Head and Neck Surgery and a Fellow of the American Academy of Otolaryngic Allergy. He is a member of the Phi Beta Kappa Society. He serves on several Boards of Directors and has been named one of the Leading Physicians of the World and was recognized in “America’s Top Physicians.” He continues to lead many charity projects worldwide as a Board Member of Dry Creek Charity. To schedule an appointment with Dr. Shah, please call (760) 291-6977. Balloon sinupasty is an advanced, minimally invasive procedure used to open sinus passages in order to relieve the pain and pressure associated with chronic sinusitis. In balloon sinuplasty, inflamed sinuses are opened in the same way that doctors open up blocked arteries during balloon angioplasty. Balloon sinuplasty is most often recommended for people who have tried all other forms of treatment without success. Its safety and effectiveness are well-documented. If you suffer from chronic sinusitis and have tried other alternatives without success, ask your Primary Care Physician about a referral to a Graybill Ear Nose and Throat Specialist experienced in performing balloon sinuplasty. RaghunandhanS, BansalT, NatarajanK, KameswaranM. Efficacy & outcomes of balloon sinuplasty in chronic rhinosinusitis: a prospective study. Indian J Otolaryngol Head Neck Surg. 2013 Aug; 65(Suppl 2): 314-319. Cold sores and canker sores are very common types of lesions in and around the mouth. Both can make it very painful to talk or eat. While the two lesions are often confused with one another, they, in fact, have very different causes and treatments. Canker sores are small white or yellow ulcers on the tongue or inside the lips and cheeks. They typically last between five and ten days. Most canker sore sufferers are children or young adults between the ages of 10 and 20. While the precise causes aren’t known, they are believed to result from a combination of factors, including mouth injuries, acidic or spicy foods, vitamin deficiencies, hormones, or stress. Canker sores are not contagious since they are neither bacterial nor viral. Topical, over-the-counter corticosteroid creams can relieve pain and irritation. Unlike canker sores, cold sores are caused by a highly contagious virus called herpes simplex type 1 (HSV-1). Also known as fever blisters, cold sores are small blisters that typically appear outside and around the mouth. They are filled with clear fluid and surrounded by skin that is red, swollen and sore. The blisters can rupture then scab over before healing within 1 to 2 weeks. HSV-1 usually enters the body through a break in the skin in or around the mouth. A person can spread the virus by touching the sore or coming in contact with the fluid, often through kissing or sharing eating utensils. Once infected, HSV stays in a person’s body for life. Some people who are infected will never develop cold sores. For those who do, relief can be found through skin creams, ointments or antiviral prescription drugs. If sores persist, ask your Primary Care Physician about a referral to a Graybill Ear Nose and Throat (ENT) Specialist. An ENT physician will do a thorough examination to be sure that oral cancer isn’t present in the mouth. Image guidance surgery is an advanced, minimally invasive procedure used to treat severe chronic sinusitis. Used in conjunction with preoperative computed tomography (CT) scanning, image guidance surgery provides the surgeon with three-dimensional, high-resolution, real-time images. This visual clarity allows the surgeon to perform with greater precision. Higher risk patients who have undergone previous surgery that disfigured anatomical landmarks. *Image guidance surgery is performed on an outpatient basis at the Rancho Bernardo Surgery Center in Rancho Bernardo, California. If you suffer from chronic sinusitis, ask your Primary Care Physician about a referral to a Graybill Ear Nose and Throat (ENT) Specialist experienced in performing image guidance surgery. "Everyone on Dr. Shah's staff is so nice, excellent service! I will be thanking Dr. Shah always for doing an excellent job on my surgery. The best!" "I had a sinus surgery with Dr. Shah. I am very happwith the results. I will recommend him to everyone in my family. He and his team took excellent care of me. Thank you so much for everytyhing. " "Dr. Shah is the most caring doctor (& his expertise) that I have come across in a long time. Remembering that i hve been in the medical field myself for 17 years."